(Nanowerk News) Researchers from ETH Zurich have developed tiny valves that enable individual nanoparticles in liquids to be separated and sorted (Nature Nanotechnology, "Single entity resolution valving of nanoscopic species in liquids"). The valves can be used for a very broad range of tiny particles, including individual metal and semiconductor nanoparticles, virus particles, liposomes and larger biomolecules such as antibodies. In order to open and close the nanoparticle flow in ultrathin channels, the ETH scientists made use of electric forces. They worked with channels etched into a silicon chip. These had a diameter of just 300 to 500 nanometres – less than a hundredth of the diameter of a human hair. They then constructed nanovalves in these channels by narrowing the channels at desired valve locations using nanolithography and placing an electrode on both sides of these bottlenecks. Nanoparticles in pure water cannot simply pass through the bottleneck; for them, the valve in its basic state is closed. By activating the electrode in particular ways, the electrical field in the bottleneck can be changed. This leads to a force acting on any nanoparticles present, which pushes the particles through the bottleneck – this is how the valve is “opened”. Nanoparticles in a saline solution, however, behave differently: they can pass through the bottleneck in its basic state – for them, the valve is “open”. Yet as the scientists were able to show these particles can be stopped at the electrodes through a skilful application of alternating electrical fields. In this way, for example, biological particles such as viruses, liposomes and antibodies that are usually present in saline fluids both in nature and in the laboratory can be easily manipulated. As part of a proof of concept, the scientists prepared an isolation and sorting lock with a junction and three valves on a silicon chip (see image above). 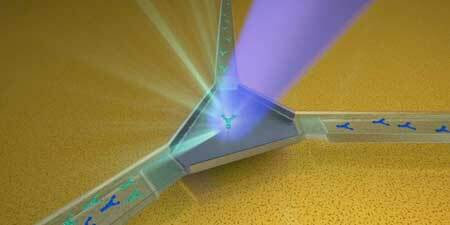 An individual nanoparticle can be captured and examined at the junction. The valves can then be controlled so that the particle leaves the system through one of two outlet channels, allowing nanoparticles in a liquid to be sorted into two classes. Together with colleagues from the University of Zurich, the ETH researchers succeeded in using the system to manipulate tiny semiconductor nanoparticles (quantum dots) and antibodies – both with a diameter of just 10 nanometres. As the scientists emphasise, it is, in principle, possible to arrange a complex nanochannel system with any number of controllable valves on a silicon chip. “By fine-tuning the electrical field at the electrodes, in the future it could be possible to use the valves as a filter, letting particles with particular physical properties pass through while blocking others,” says Christian Höller, a doctoral student in Poulikakos’ group. The scientists would now like to further develop the technology together with partners to bring it up to readiness for standard use in research. Since it enables particles on a small chip to be sorted, for example, it could be of interest in materials science, chemistry or biomedicine. It may also be possible to use this technique to isolate synthetic or biological particles to examine them microscopically or to analyse them under the influence of pharmaceutical drugs.